One of the best things about autumn is the beautiful colours as the trees prepare to shed their foliage for a winter of hibernation. I really wanted to share the joy of nature's very own firework display with my two youngest. So we set off to collect some of our favourite coloured leaves on a walk. 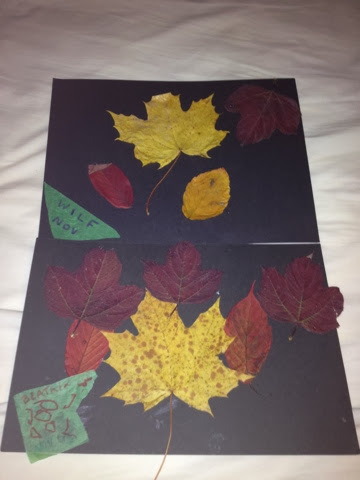 When we got home, we had a simple sticking session, using glue sticks and some black card, to make our striking autumn leaf pictures. What do you think? What autumn crafts do you do with your pre-schoolers?